Experience the Florida Springs with us. This is the undiscovered Florida. A place where water and life begin from a source that bubbles up directly from the ground. Florida Springs flow the purest, clearest, and freshest water in the world with underwater views that are absolutely breathtaking. Enjoy the unique privilege that is exclusively here in Citrus County Florida by swimming with the manatees in the spring-fed King’s Bay Wildlife Refuge! 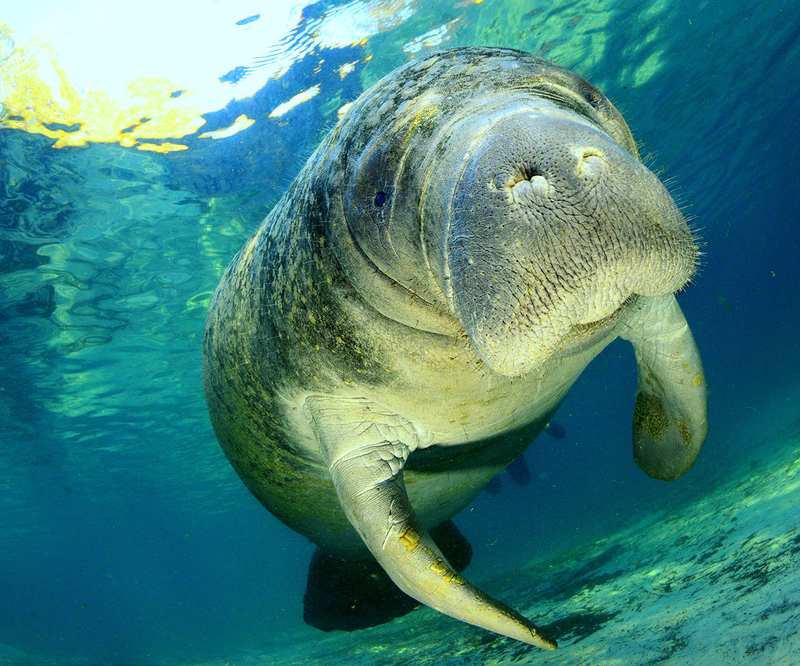 Crystal River is home to the world’s largest population of endangered manatee during the winter season, and even a small population the warm months. Having the chance to encounter these curious, gentle giants in their natural habitat is an adventure that you will never forget! You will earn your PADI Distinctive Specialty, Manatee Awareness. Catfish Hotel sink is quite large, it drops off from a depth 15 feet around the end of the steps to 50 feet, after which you are in a cavern zone. DO NOT ENTER THE CAVERN UNLESS YOU ARE CERTIFIED TO DO SO. There are a bunch of fallen trees at the deeper section of the sink, which are cool to swim around, and there is a ledge cut into the wall at the 15 foot range which is pretty nice to check out. The bottom is a mix of rubble, sand and clay. There is virtually no flow in this spring. The sink is usually covered over in a thin layer of duckweed. This is completely harmless to divers, and is good for water quality! Duckweed stops algae from growing underneath in the water which would deteriorate the visibility. Visibility ranges from 30-70+ feet. Manatee Spring and its run are on the eastern side of the Suwanee River. The spring pool measures 60 feet by 75 feet. The deepest depth of the spring pool is 25 feet, with a sandy bottom and submerged logs. A set of wooden steps leads down to the water. There is a large boil associated with this spring. Wildlife you can expect to see when diving here are sunfish, catfish, small turtles and crayfish. Water temperature in Manatee Springs is generally 72F year round. Experience one of Florida's most memorable dives. The strata of prehistoric limestone that was once beneath the sea are clearly visible as you make your way around the large water filled room and at every turn more fossils are revealed. Be sure to take your time because there are so many things to see. Clear water and 72 degree constant water temperature make Paradise Springs a year-round destination. A permanent guideline and the sight of the opening visible to the diver most of the time throughout the dive makes the dive accessible for most divers. Even with a buddy, Scuba Diving is a rather solitary activity. But what happens when you come out of the water hardly is! Divers love to talk about diving. We love to be around other divers; we enjoy the shared enthusiasm, telling our dive stories, and making new dive buddies. This trip is the perfect opportunity for all of the above! We found this great house for us to use during this trip! Spend your non-diving time around the fire-pit or cooking up some food on the grill as you discuss the day’s dives and what you’re looking forward to tomorrow! Or grab a couple kayaks and go for a paddle with a new friend.